Miqobot is working with DirectX 11! Never logout from the game anymore, only to switch settings for your bot. Stay queued in Duty Finder while fishing or gathering. Fishing. Stormblood 61+ fishing skills are supported. Collectables are supported too! Gathering. With flying and swimming in Stormblood areas. Hidden items support. Favors support. Designer for 1-70 skill rotations. Spearfishing. Swimming shadows support. Automatic gig changing and Veteran Trade support. Crafting. Easy macro setup. Full speed rotation. Crafting Solver. No macro, no setup, no predetermined logic. Just pure math. Desynthesis. Just name the items to desynth. 3D Radar. Scan through the landscape for hidden quest items. See all of the gathering nodes around you! 3D Editor. Create your navigation grids for gathering and scenario scripts. PotD Radar. Coffers, cairns, traps, and Accursed Hoards. Monitor. Displays all of the vital data about your character. Diadem Treasure Hunt. Find all treasure chests and take all the loot for yourself. MGP Minigames. Out on a Limb and Finer Miner. 600+ MGP per minute. Chocobo Racing. Check out the video! All within your DirectX 11 client. And you can safely run the game in the background, Miqobot will be happy anyway. Miqobot is extremely easy to setup. To start fishing, just press the "Start" button. To scan for items with 3D Radar, just type some letters into "Filter by Name". 3D Editor is also made as friendly as possible to help you quickly setup any custom route. Just try it out! No hotkeys setup, no special icons placement. Miqobot is smart and adapts to your personal keybinds. And you can even change skill presets on the fly! You may use 3D Radar to search NPCs, players, monsters, gathering nodes, even ghosts. And new options will be available soon! Squadron Dungeons. Easy leveling, all jobs supported. Palace of the Dead. Floors 1-10. Deeper levels will be added as well. Heaven-on-High is planned too. FATE Grinding. With full flying support. Smart AI selects the best FATE route, based on currently active FATEs and other players doing them. Crafting Features. Quick setup for several recipes in a row. Triple Triad. A complete database of all cards and NPCs. With a smart AI solver. Scenario scripting. For relaxing Legendary Fishing and Unspoiled Gathering. Legendary Fish Scenarios ("Of Dragons Deep" Title out of the box). Duty Finder (Omega Farming as possible option). Ridorana Lighthouse. Need a specific piece of gear? Just name it, and Miqobot will queue Ridorana time after time, rolling the gear you need. Aethersand Scenarios. Already available in Beta! We always aim to follow the needs of our players. The game changes with every patch, so stay with us if you want to know how Miqobot solves the upcoming riddles. When you subscribe, you get access to all of the future updates as soon as they are out. Please support us, we realy need you! Upgraded for FFXIV: Stormblood Patch 4.57! Last edited by Miqobot; 2 Days Ago at 09:43 AM. Reason: No paid stuff outside trade. This is a support thread now. If you want to sell go to trade. Hey thanks for posting this. I just tried it out and can say it works well for FSH and it is by far the easiest bot to set up that I've tried so far. The 3D radar, stats and feedback about what the bot is doing are all great as well. Can see a lot of potential for this and look forward to seeing it grow. Thank you very much for your positive response! We aim to continue making future features easy to use. Miqobot successfully works after the latest maintenance! Feel free to use it and let us know if you have any issues. We have updated Miqobot according to FFXIV latest patch (released today). SO everything is working. If you have version 1.0.1 - just relaunch Miqobot. Also, with new version Miqobot will automatically inform you about updates. We have released treasure hunting in Diadem! You can exchange that gear for Brass Sky Pirate Spoils. With those Brass Spoils, you can buy top-grade battle materia and 2-star Crafting Mats. Also, this is the only way to get the Pegasus mount! And as a bonus, we have created a navigation graph for you. It is designed specifically for your Diadem treasure hunt, and it covers a full area of the map. If you make Miqobot fly along this route, with 3D Radar enabled, you won't miss a single Buried Chest! Check the video to see how to setup Miqobot properly. Also, fishing in Diadem yields you tons of Pterodactyls, which are exteremely expensive on the market right now, due to a huge demand of Pterodactyl Leather for new Crafting Gear. With Miqobot, you can make a fortune in no time, and not even break a sweat! 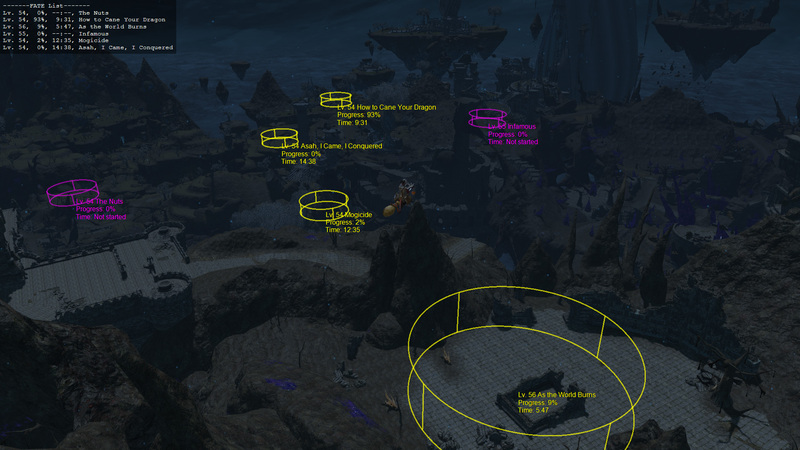 And as a little bonus, you get about 4-5 Steel Sky Pirate Spoils for each fishing session in Diadem. You can exchange those for Red Scrip gathering mats and top-grade Crafting and Gathering materia. Check our video for details! And last, but not the least. For all of you guys to be able to test new features in this release, we decided to reset trial catnip, so everybody who already used their own can now get fresh one! Enjoy playing with Miqobot! Last edited by Miqobot; 11-27-2015 at 08:58 PM. Miqobot has been fixed and successfully works after today's maintenance (12/01/2015)! Feel free to use it and please let us know if you have any issues. Basic functional is completely working. Now you can easily setup your bot and collect any resources from 1 to 60 level. Just create navigation graph, select gathering and click "start". Miqobot will do the rest. 1. Select/Change resource slot on the run. 2. 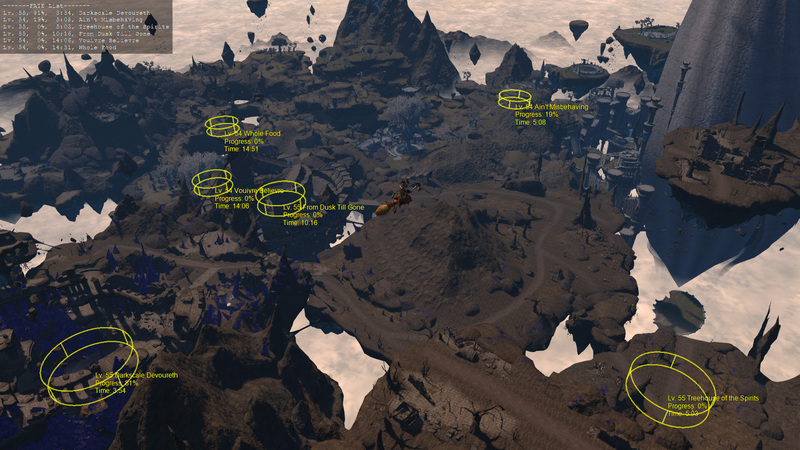 Flying in Heavensward locations is fully supported! 3. 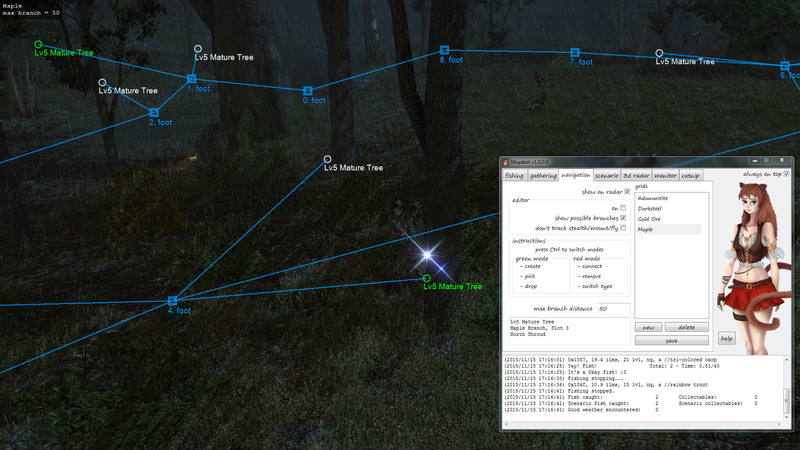 Gathering Node's name filter is applied the same way as in 3D Radar. Can be used to filter unwanted resources. 4. Max distance for more precise searching area. 5. Beacon points for improving navigation on big distances. 6. You can highlight monsters on your 3D radar now. Last edited by Miqobot; 02-25-2016 at 10:00 PM. Now that the patch 3.15 is out and the painful Relic grind is officially confirmed, we are happy to announce that Anima Farming is in active development! First of all, we will add FATE support for 3D Radar, so you will see all active FATEs, including hidden ones, with no need to open the map. Also, we implement an additional AI module which will track each FATE's progress and your personal investment. It will leave the FATE area early and try to participate in as many FATEs as possible, while receiving Gold rewards everywhere. With this AI, you will be able to receive Anima Tokens and level up your alternate classes efficiently, all at the same time. For 2nd and 3rd stages of Anima, we are planning a Duty Finder bot (with Alexander as possible option). Crafting 1-star tokens is also on its way. More details will be revealed later. This is coming along nicely! Can't wait for all the new features. The FATE grind will let me level up an alt account finally...I've just been too busy and frankly too lazy to do it myself. That said, the existing features are pretty amazing too; especially auto stealth...the mob detection is spot on and I haven't been aggro'd yet. Great job on thiope people took advantage of the half off! And yeah, we are going to release FATE Grind as soon as possible, because we are the same players like you, and we understand how useful it will be. By the way, here's a sneak preview of the FATE Radar. FATE Radar. Shows you all FATEs in the current location in full 3D. Also shows hidden FATEs (the ones where you have to talk to NPC). Gathering Senses. Miqobot can now use compasses (Lay of the Land/Arbor Call) and Truth (of Mountains/of Forests) in order to locate gathering nodes far away. Beacons Rearrangement. Miqobot will no longer backtrack to previously visited beacons after gathering once. Improved Gathering AI. Mistakes in navigation routes do not lead to Miqobot getting stuck. She will try rotating camera to focus on gathering node. And even if nothing helps - Miqobot will blacklist a badly positioned node to prevent running in circles. "Cloud Mica" is an example of using beacons. "Star Ruby/Sapphire" is an example without beacons. Make sure to enable "use compass" on Gathering tab. There will be a lot more presets in the future. Hey, due to the new humble bundle my gf will start to play this game (and i will resub) - and i'm looking forward to try your bot! It looks very good and I like it's features. I'll give the 48 hour trial a shot next week. Hope that you both will not be disappointed. Enjoy and feel free to ask any questions if you need help. Should deff set up a forum, where you can exchange profiles and talk about issues and whatnot.